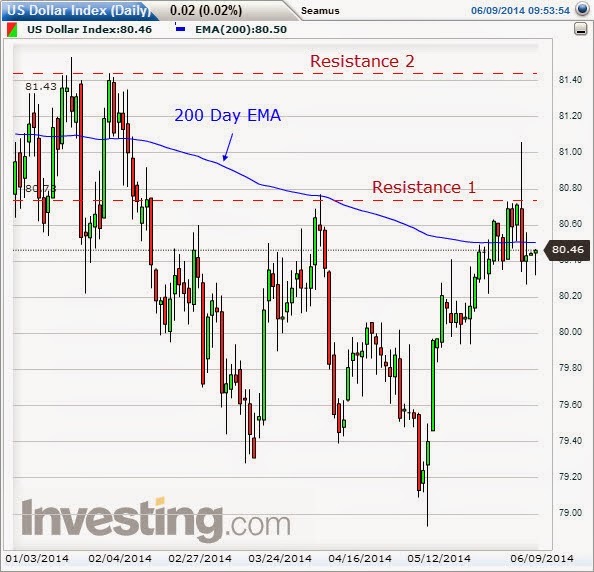 OmiCronFX : The US dollar index (USDX) | Is USDX on the move? The US dollar index (USDX) | Is USDX on the move? The InterContinental Futures Exchange (ICE) US dollar index is a measure of the value of the US dollar against important other major global currencies. There is also a trade weighted US dollar index, which incorporates many more currencies and which is based on the level of trade between the counties concerned and the USA, but the ICE index is consulted to a greater extent by Foreign Exchange traders. 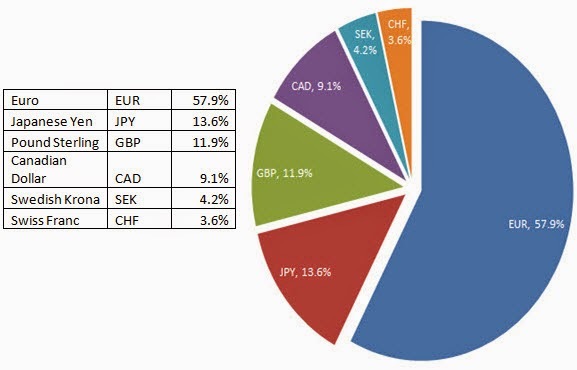 The dollar index comprises of the weighted averages of the values of the Euro, Japanese Yen, Pound sterling, Canadian dollar, Swedish Krona and Swiss franc. The weights of each that are used to calculate the average are as in the table above. These weightings have ever only been recalculated once, on the occasion of the introduction of the Euro. Then several currencies were incorporated into the Euro and at the same time disappeared as individual units from the dollar index. The dollar index can be and is traded, just like the currencies that go to make it up. It is also amenable to Technical Analysis. Its TA formations, support and resistance levels and other indicators are watched just as carefully on the USDX chart as they might be on any other. Is USDX on the move? In the above daily chart of the US dollar index, it can be seen that the instrument made an effort to get above its 200 Day Exponential Moving Average (DMA). This move has been rejected, at least for now, by the market. It can also be seen that it occurred at a level of resistance. Even if it does break through this there is another resistance level above it. In addition, the 200 DMA is sloping down, which is on average a bearish indication. There was considerable turbulence in the value of the index during and after the recent ECB announcement on interest rates. This is not surprising as the Euro is the largest component of the index. All in all, from the Technical Analysis point of view, the US dollar could be in for a fall from here. The fundamentals, in the form of the well signalled determination of the Federal Reserve to keep interest rates low for the foreseeable future, would facilitate this outcome.